You don’t have to buy store bought crackers you can make them at home with our recipe. 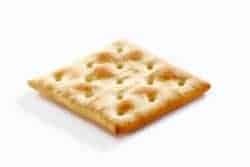 You can make homemade crackers, thee taste better than boxed crackers. Mix to make like pie dough, turn on slightly floured surface. Roll with rolling pin until very thin. Cut into square and pick several times with a fork. Bake on bottom rack in a 400-degree oven for 10 minutes. Then remove and place on top rack and increase temperature to 450 degrees to brown the crackers. Immediately salt to taste when removed from oven. Can we freeze the dough to make at a later time. I would not do this, I would just make them at another time. These are wonderful! Quick to make and super tasty! I’ve tried these will herbs mixed in and I’ve also sprinkled them on the top with the salt after cooking. My family eats them quicker than I can make! ???? Thanks for a great recipe, they’ve become a family favorite! I am happy you have enjoyed the recipe. Like everything made from scratch, so much better than store bought crackers. Super easy and fast recipe. Next time I will try some variations like cracked pepper or rosemary garlic flavour. This sounds easy I’ll have to try it!